If you’re in a hurry, the answer is Liscannor, Co. Clare. 5 pubs for 129 people, or 1 pub for every 26 people. 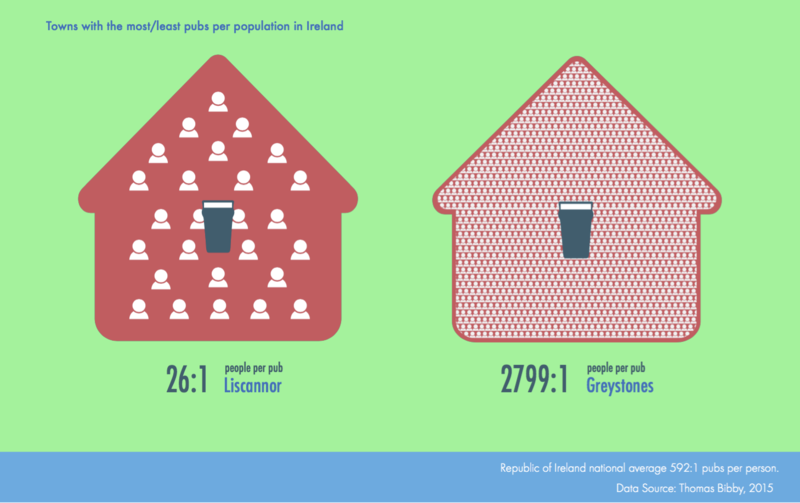 And on the other extreme, the town in Ireland with the fewest pubs is Greystones, with 4 pubs for 11,194 people, or 1 pub for every 2799 people. The wonderful infographic was made by my friend Gimena who is an extremely talented interface designer – check out her portfolio. There’s a lovely cycleway called the Great Southern Trail in County Limerick, and we cycled the western end of it a few weeks ago, ending in Abbeyfeale, a small town on the Limerick/Kerry border. Growing up down the road in Adare, I remember people claiming that Abbeyfeale had the most pubs per head in Ireland. Walking round in search of a pint to reward my cycling efforts I wondered, was this true? Barstool talk was all we had in the nineties, but surely someone had done a bit of a study since. A half an hour of web searching later, all I could come up with was a few forum posts essentially containing the same barstool talk as I’d come across before. Cycling back I had a bit of time to think about this. I knew the Central Statistics Office (CSO) had the population of each town, but how to get a list of pubs? I had been looking for an excuse to fool around with a bit of Python, and this seemed like the perfect chance to write a small web scraper to get the data. There is a Vintner’s Association of pubs which had a membership list, and the Golden Pages (our equivalent of the Yellow Pages) had a pretty comprehensive list of businesses with a landline (every business with a landline gets a free listing). I was all ready to write my little scraper when my friend Emmet pointed out that because running a pub is a licenced business, there was probably a public list, and there was, on the Revenue Commissioner’s site. It was even available as an Excel file, with the address lines in separate columns! My excitement quickly waned as I waded through the horrible morass that is Irish addresses. 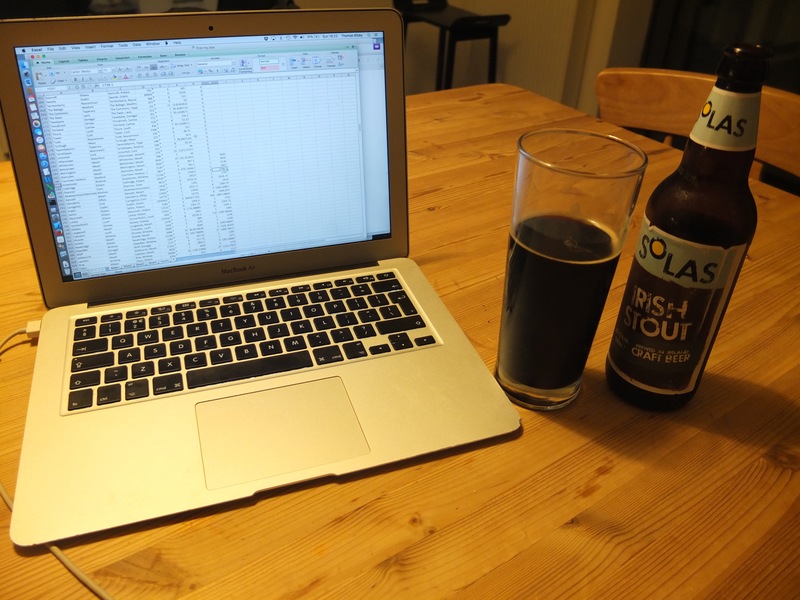 My original idea was to get the data into a database so I could do some fun analysis – now I was definitely stuck in Excel as this job was 95% cleaning data. Fortunately I managed to harangue Emmet into helping me with some Excel tips and tricks. Irish is our first official language, so every address has two completely separate legal forms, both of which are equally valid. Either the Irish or the English name is picked as the ‘official name’, but this has little to do with what is used in reality. Pubs in Roosky put their address down as Roosky, Carrick-on-Shannon, Co. Roscommon. No matter that Carrick-on-Shannon is in Co. Leitrim, that’s where their local post office is. But I was getting a few pubs in Carrick-on-Shannon, Co. Leitrim and a few in Carrick-on-Shannon, Co. Roscommon, and they all had to be cleaned up. This is surprisingly common. Sometimes locals completely ignore the official spelling for their town, for example Pallas Grean in Co. Limerick vs. Pallasgreen. Yet it was ultimately Liscannor, and not Feakle, that I judged the winner of my ‘most pubs per capita’ award. The answer again comes down to post office locations: in rural Ireland the second-last line of your address is normally your local post office. So even though 7 pubs had Feakle as their address, at least 3 were a long way outside Feakle in another village. But second on my list was Liscannor: even though 2 of its 7 pubs were a small way outside near St. Bridget’s Well on the way to the Cliffs of Moher, 5 hostelries (4 pubs and 1 hotel) were definitely within the small village of 129 people, giving an incredible ratio of 1 pub for every 26 people. I gave up at this point, satisfied that I had my winner. But I was a bit sorry I didn’t get the data cleaned up a bit more – in particular 3rd place Lifford with an incredible 55 pubs for under 1700 people sounded fascinating – but my lack of knowledge about Donegal local geography prevented me from cleaning the data much further (I suspect some of these 55 pubs were in villages outside of Lifford). I’ve provided the cleaned data files for both towns by population and pubs by address in case anyone else wants to have a go. The two files can be joined in a spreadsheet with a simple COUNTIF statement or similar. I’m not sure about the copyright status of either file, the pubs file is based on publicly available data about commercial businesses, and equally the CSO data is publicly available, but I’m not sure under what licence. Any changes I have made to the original data you may use in the spirit of finding a good place to go boozing.